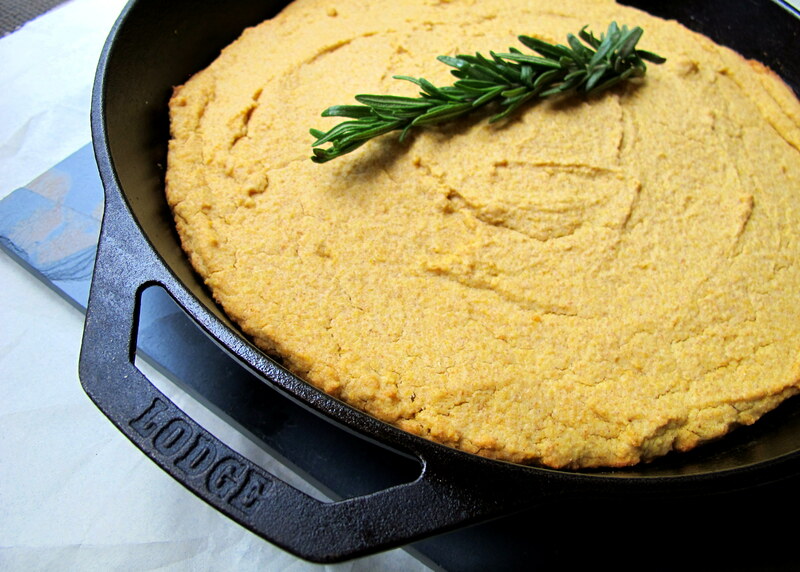 I had never eaten corn bread before moving to the USA, which isn’t really that surprising. I suppose back home our cheat’s bread is damper and many Americans wouldn’t have tried that, either. The first corn bread I tried was a sweet version that I’m pretty sure had corn grits in it as well, judging by the texture. It was moist and chewy and sweet and delicious but really only a one trick pony. The savoury version you can use as sandwich bread, as the base to a stuffing, serve it with soup etc. Much more versatile. 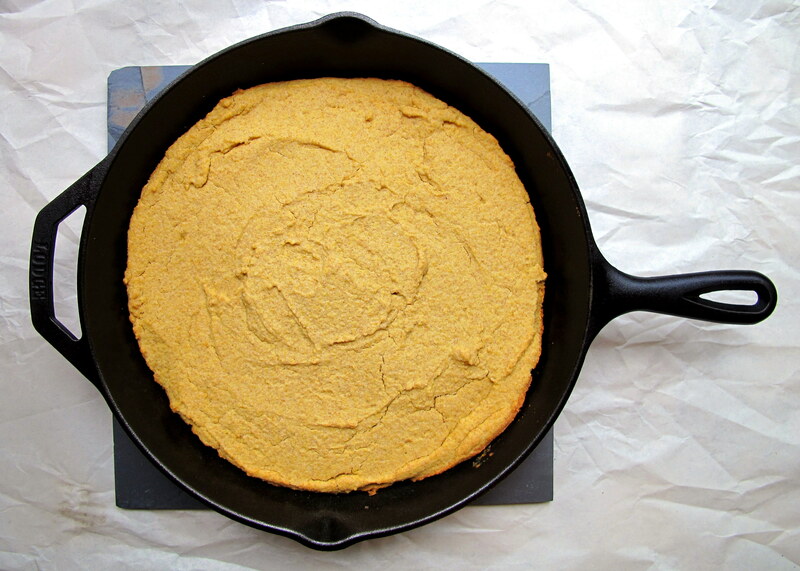 The following recipe I based from reading about corn bread in general – to get an idea of ingredients, as well as the method. The website I found most useful was The Paupered Chef, as I particularly liked the idea of soaking the corn meal in the buttermilk (they used milk) beforehand. 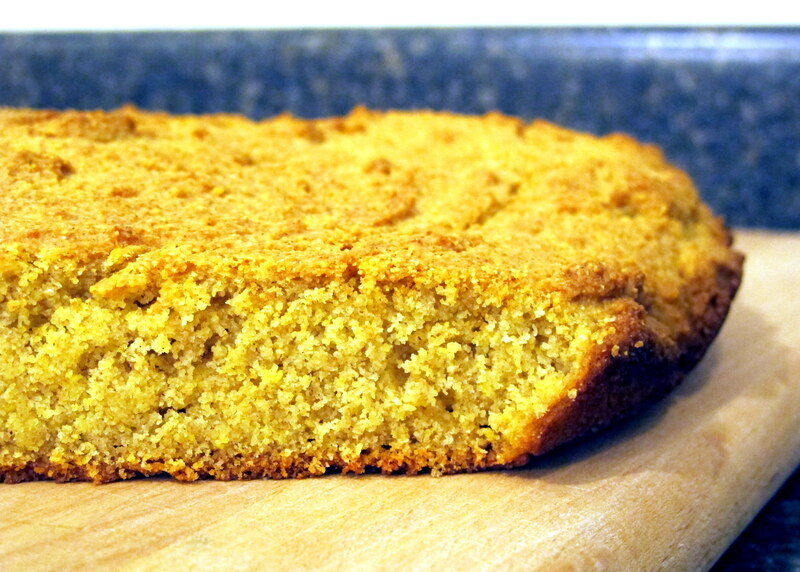 Some say that true Southern corn bread is 100% corn meal, others say that that’s untrue. Not being from the South, let alone the country, I have absolutely no opinion on what is or isn’t traditional, I’m just making what I find tasty. Corn is a tricky one. The FODMAP content depends on the variety; sweet corn can be troublesome for some with FM due to the high sugar content and some people are sensitive to GMO crops, of which corn is the poster child (I’m not going to enter the GMO debate here, though). However, the sweet corn that is grown for eating on the cob isn’t the same corn that is used for corn meals, flours or starches and it’s different again to corn that is grown for use in plastics and bio-fuels. Corn meal is not made from sweet corn, thus is much better tolerated. There are specific corn allergies, though, so watch out for those. Rye can be substituted in for the GF plain flour, if you can tolerate it. As I have mentioned before, studies show that rye flour contains more fructans than wheat but evidence suggests that the chains are longer, thus taking longer to ferment. It is generally less of an irritant than wheat to those with FM, although many still have problems. If you have a gluten issue or are very sensitive to fructans, replace the rye flour with your favourite gluten free blend and 1/2 tsp. of xanthan gum (or 1 tbsp. chia seed meal). Buttermilk contains lactose, which is water soluble. If you malabsorb lactose then replace it with the same volume of LF milk with a dash of lemon juice. This quantity cooks well in a 12 ” cast iron skillet. Combine the corn meal and buttermilk in a large mixing bowl – everything will end up in here eventually – and let it sit for 10 minutes. Meanwhile, preheat the oven to 230 C/450 F. Place your cast iron skillet (or any skillet with an oven safe handle, the heavier its base the better) in the oven to heat up. Please remember to now use gloves whenever you handle the skillet! 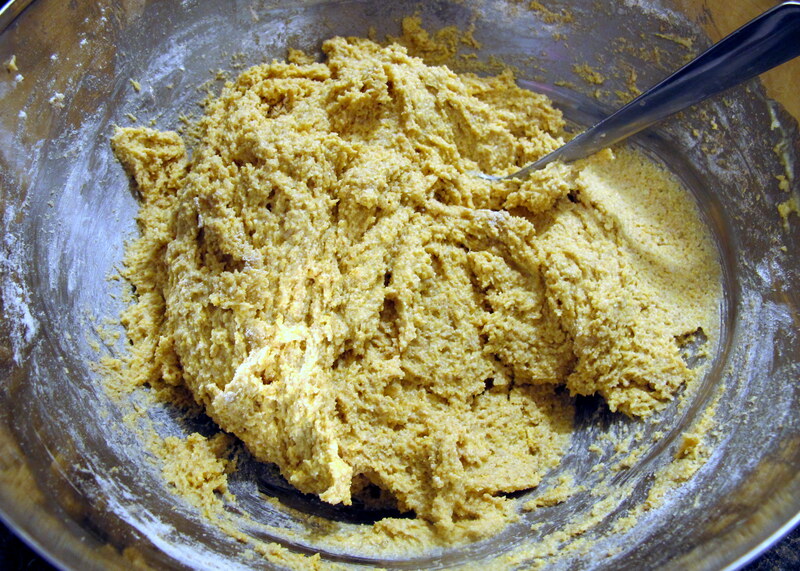 While the corn meal is soaking, sift the flour (with any necessary xanthan gum or chia meal), baking powder, salt and the optional herbs into a separate bowl, and combine the eggs and softened butter (the softer, the better) in another. When the corn meal and buttermilk have been sitting for the ten minutes, add in first the wet ingredients and then gradually add and mix in the dry ingredients – depending on your particular flours of choice, etc, you may or may not need all of it. 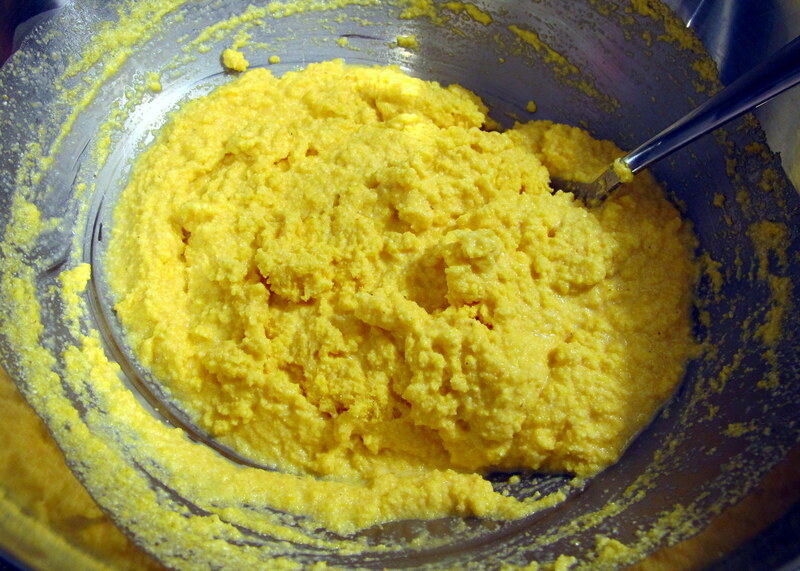 The mixture should resemble a thick cake batter. Now, take the skillet out of the oven and grease it up with either a dollop of butter or olive oil, or even lard – I used butter. Spread your lipid of choice all around the base and at least half way up the sides of the pan and tip out any excess. Plonk the batter (it is too thick to pour) into the waiting skillet, make sure it is evenly spread out and pop it in the oven. 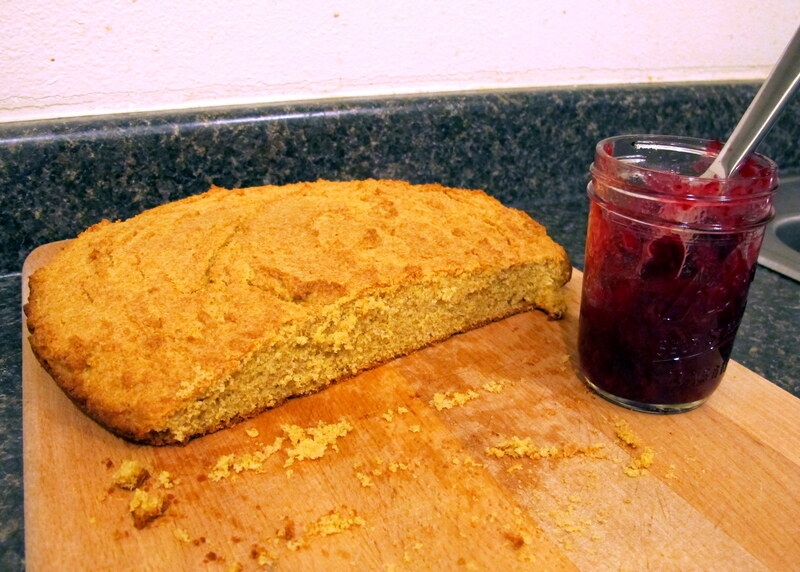 12″ cast iron skillet – 25 minutes at 230 C/450 F.
Loaf tin – 50 minutes at 180 C/350 F (until a skewer tests clean). Let it sit in the skillet for 10 minutes to cool slightly and then turn it out onto a wire rack. Let it sit for half an hour before cutting, or it may crumble. 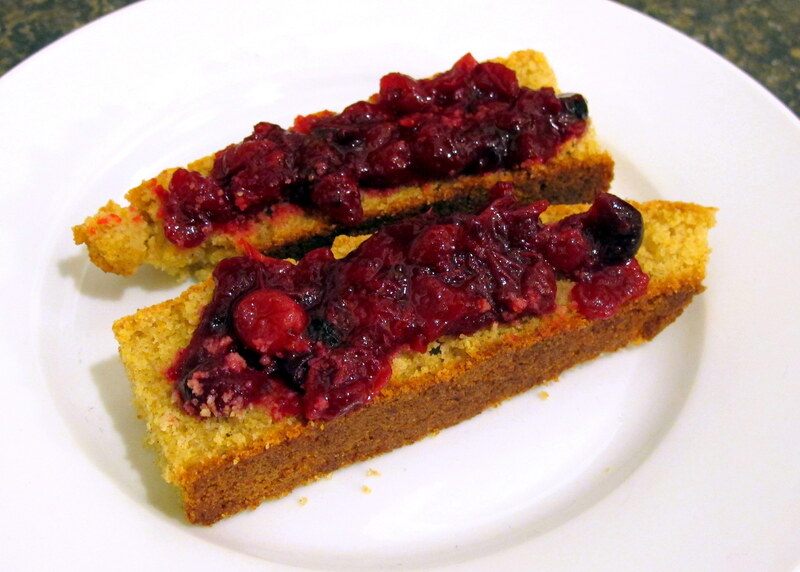 This corn bread works well as sandwich bread (in a loaf pan), served with soup etc, it goes very well with my cranberry sauce/jam and can be used in a corn bread stuffing, the recipe for which I will be posting next. Stay tuned! This entry was posted in Cakes, cupcakes & scones, Christmas Recipes, Entrees, Appetisers and Sides, Lunch, Sweets and Desserts and tagged American cuisine, Aussie, Australia, cast iron, corn, corn bread, corn meal, cornbread, cornmeal, dinner, entree, FODMAP, FODMAPS, food, fructose friendly, fructose malabsorption, gluten free, home-cooked, homemade, jam, jelly, lactose, Lodge cast iron, low fructose, preserves, Seattle, sweet, vegetarian. Bookmark the permalink. 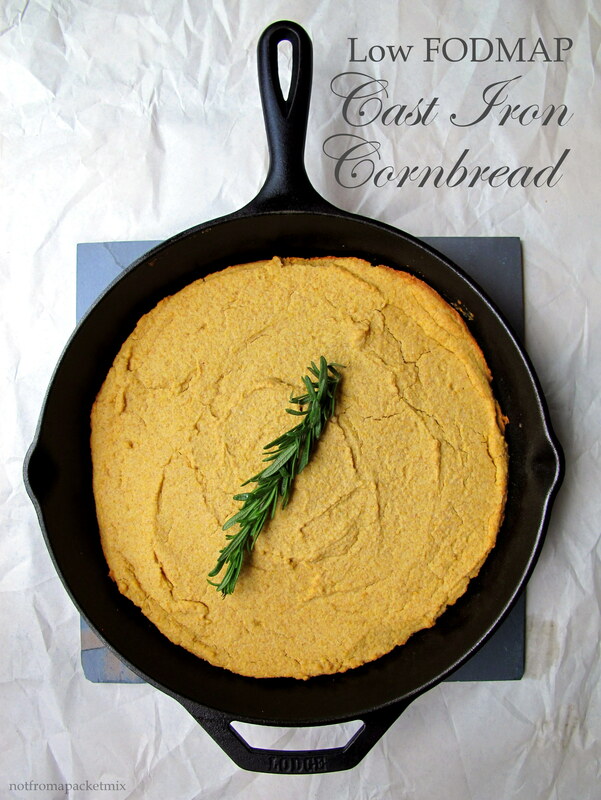 I’ve been looking for a good cornbread recipe!